Description: Build Bridge Game a fun physics-based game that will really test your master mason skills. You need to build the bridge to get the creatures to the other side. You have a limited amount of money to build each bridge. To build a piece of the bridge, click background somewhere to start and draw a line to where you want the piece to end. Download the free game and put your creativity and ingenuity to the test while playing this construction game. 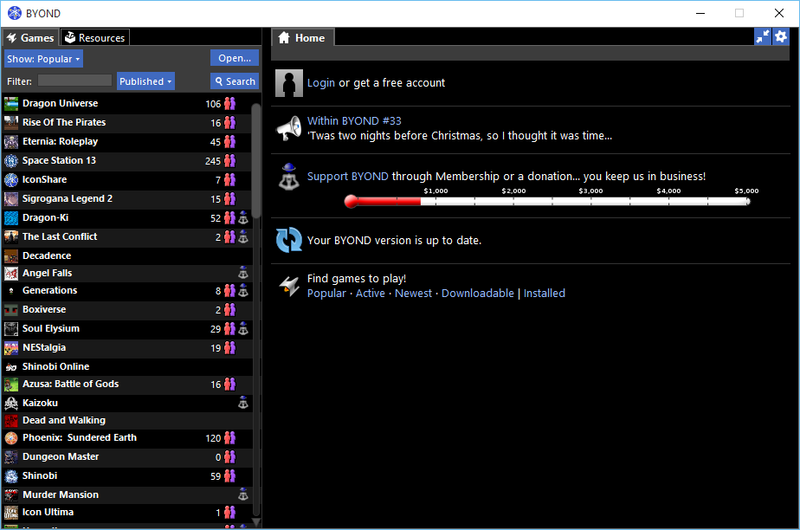 Description: BYOND (Build Your Own Net Dream) is the premier platform for making and playing online multiplayer games. As a player, enjoy countless games created by people just like you. As a developer, make your own indie sensation with an easy-to-learn language, built-in online support, tools for developers, and plenty of articles and tutorials. Description: CheatBook-DataBase 2016 is a freeware "cheat-code tracker" that makes hints and cheats (for PC, Walkthroughs, Playstation, Playstation 2, Playstation 3, Playstation 4, Sega, Nintendo 64, Nintendo DS, DVD, Gameboy Advance, Gameboy Color, N-Gage, Nintendo DS, Xbox, XBox 360, Xbox One, iPhone, Gamecube, Dreamcast, Super Nintendo, Wii U, Sony PSP) easily accessible from one central location. Description: CheatBook-DataBase 2017 is a freeware "cheat-code tracker" that makes hints and cheats (for PC, Walkthroughs, Playstation, Playstation 2, Playstation 3, Playstation 4, Sega, Nintendo 64, Nintendo DS, DVD, Gameboy Advance, Gameboy Color, N-Gage, Nintendo DS, Xbox, XBox 360, Xbox One, iPhone, Gamecube, Dreamcast, Super Nintendo, Wii U, Sony PSP) easily accessible from one central location. Description: CheatBook-DataBase 2018 is a freeware "cheat-code tracker" that makes hints and cheats (for PC, Walkthroughs, Playstation, Playstation 2, Playstation 3, Playstation 4, Sega, Nintendo 64, Nintendo DS, DVD, Gameboy Advance, Gameboy Color, N-Gage, Nintendo DS, Xbox, XBox 360, Xbox One, iPhone, Gamecube, Dreamcast, Super Nintendo, Wii U, Sony PSP) easily accessible from one central location. 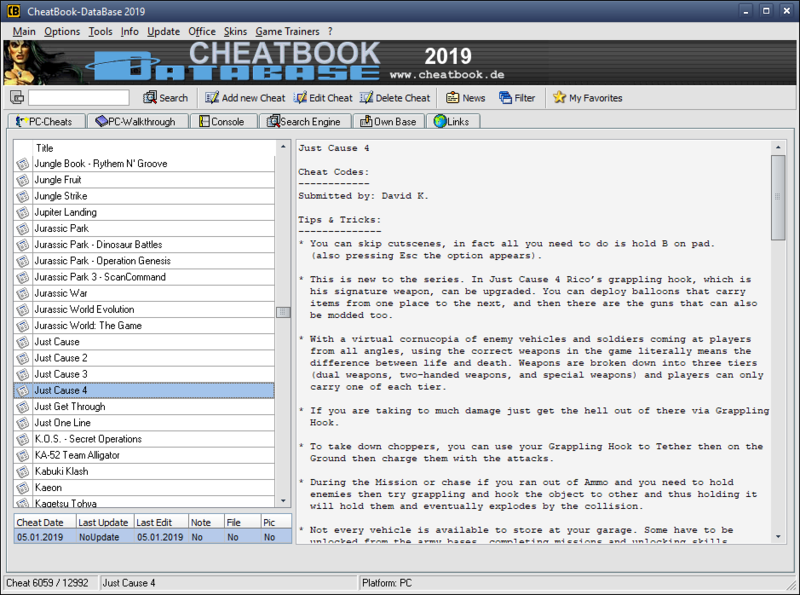 Description: CheatBook-DataBase 2019 is a freeware "cheat-code tracker" that makes hints and cheats (for PC, Walkthroughs, Playstation, Playstation 2, Playstation 3, Playstation 4, Sega, Nintendo 64, Nintendo DS, DVD, Gameboy Advance, Gameboy Color, N-Gage, Nintendo DS, Xbox, XBox 360, Xbox One, iPhone, Gamecube, Dreamcast, Super Nintendo, Wii U, Sony PSP) easily accessible from one central location. 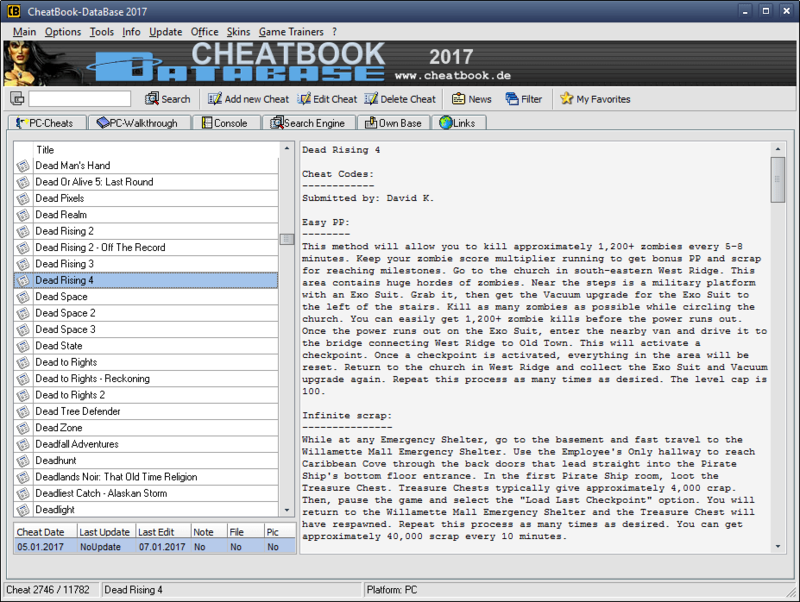 Description: CheatBook (01/2016) - Issue January 2016 - A Cheat-Code Tracker with Hints, Tips, Tricks for several popular PC Action and Adventure Games. 417 PC Games, 20 Walkthroughs for PC and 81 Console Cheats are represented in this new version from Strategy Games, Adventure Games to Action Games. This Database represents all genres and focuses on recent releases. Games are listed alphabetically in the left-hand window. 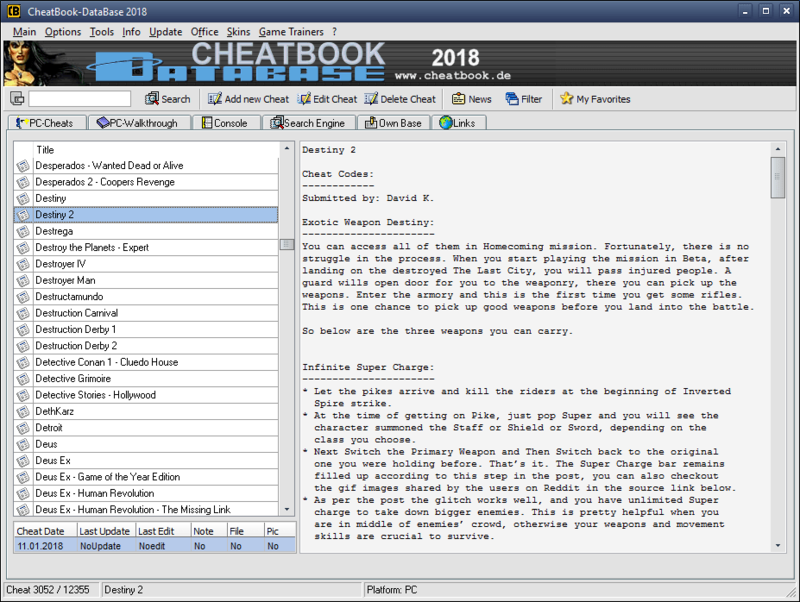 Description: CheatBook (01/2017) - Issue January - A Cheat-Code Tracker with Hints, Tips, Tricks for several popular PC Action and Adventure Games. 286 PC Games, 6 Walkthroughs for PC and 63 Console Cheats are represented in this new version from Strategy Games, Adventure Games to Action Games. This Database represents all genres and focuses on recent releases. Games are listed alphabetically in the left-hand window.